Your physician will have probably asked you to discontinue for a few days (if you take) any anticoagulant, like Warfarin or Sintrom, in order to reduce the risk for bleeding, but will probably let you continue your antiplatelet drug like Clopidogrel (Iscover, Plavix) or Aspirin. The first part of any operation is the administration of anaesthesia. 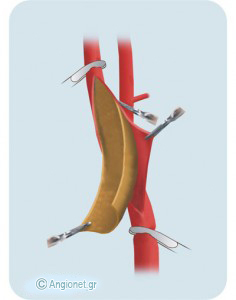 Carotid endarterectomy is usually performed under general anaesthesia. It is feasible under local-regional anaesthesia too, but this technique does not seem to be superior to general anaesthesia. Initially, through an IV in your arm, used to provide you with fluids and medications, you will receive the anaesthetic which will put you to sleep within a few seconds. Then, a catherer will be inserted in a larger vein to give you the fluids required during and after the operation, and an “arterial line” will be used for continuous monitoring of your blood pressure. A urinary catheter may be placed in your bladder to monitor your urine output. An incision will be made on the side of your neck, about 8-10 cm in length. After displaying the carotid artery, the flow in it and its branches will be arrested with vascular clamps. An incision will be made along the artery to open it and the plaque which is causing the narrowing will be carefully removed. A shunt (narrow plastic tube) may be used to protect the brain from interruption of its blood supply when it is clamped. When the inside of the artery has been cleared, it is closed with very fine stitches either directly or with the use of a small patch stitched to the artery to prevent further narrowing. This patch can be made of plastic material (usually Dacron or PTFE), but sometimes a vein from your leg may be used or a piece of animal tissue (bovine). The wound is closed either with stitches or metal clips which will be removed after 5-7 days or with absorbable sutures not requiring removal. You may also have a small plastic drain near your wound for a short period to observe for bleeding and prevent a blood collection. Following the operation you may be transferred to the Intensive Care Unit (or the High Dependency Unit) for closer observation, where you will stay for 24 hours and then you will return to your normal ward. You will wake up immediately at the end of the operation and your mobility will return to normal more or less immediately. You should not have much discomfort. Following this sort of surgery you are unlikely to feel sick and you should be able to eat and drink again within a few hours. Some swelling in the neck is not uncommon and it settles within 7-10 days. The scar will become virtually invisible within several months. Most people stay in hospital for 1-3 days after carotid endarterectomy. If you notice a large swelling in your neck, severe headache or any dysfunction like weakness of a limb or change in consciousness level, contact your doctor immediately. Each of these complications is rare, but overall it does mean that some patients may not survive the immediate post-operative period or be handicapped. For most patients this overall risk is around 2% – in other words 98 in every 100 patients will make a full recovery from the operation. Your medical team will take all precautions to prevent any problem and try to correct it as early as possible. If your risk of a major complication is higher than average, usually because you suffer from a serious medical problem, your vascular surgeon will discuss it with you. It is important to remember that your vascular surgeon will recommend the operation only if he/she believes that the risk of a serious stroke without operation is greater than the risk posed by the operation itself. Although carotid endarterectomy significantly reduces the risk of future stroke by removing the dangerous atherosclerotic plaque and has very good long-term results, the procedure does not stop plaque build up. To preserve its success, you should seriously consider changes that will help avert the chances to further damage your arteries. If you don’t, you are at increased risk for a heart attack, a stroke or problems with the circulation to your feet.